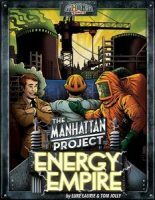 Manhattan Project: Energy Empire is a stand alone game in our "Manhattan Project" line of games. It shares many of the same mechanics from the original top 150 award winning game, but with less "take that" actions. Designed by established game designers Luke Laurie and Tom Jolly. For everyone’s information, ignore the that this is stated by bg.com as an expansion as it isn’t. It is not compatible with the game Manhattan Project. The game is however amazing! It is better than the previous game in this line and has the same worker Placement but plays and feels very different. It is a medium to heavy euro and not a family game. This will be enjoyed by stategy gamers rather than family’s or some casual gamers. Add a Review for "The Manhattan Project: Energy Empire"